SET: Research Information for Teachers (NZCER Press) has published a useful interview on “The who, what, when, where, and why of SOLO Taxonomy. 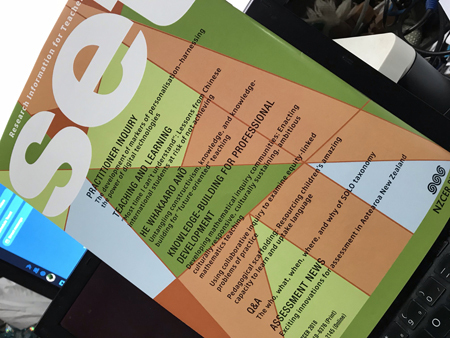 Editor Josie Roberts has done a great job in capturing what is worth knowing about the classroom based use of SOLO Taxonomy. The question and answer format makes the material accessible to teachers. It makes for great professional reading and discussion for those thinking about starting to use SOLO as a model of learning and for those already implementing SOLO with their students. Here are the Victorian video case studies I have been promising to share for some time. They speak highly of their outcomes using SOLO as a whole school approach. You are welcome to share them in collaborative inquiry with your teachers. 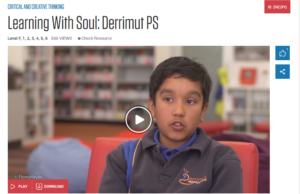 Derrimut PS was purpose-built around collaboration with campfires, caves and watering holes allowing for students and teachers to come together and learn. The caves are for deep thinking; the watering holes to share information; and the campfires for when students are telling their learning journey. 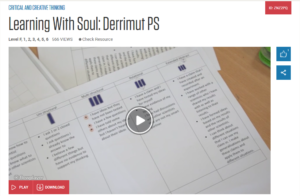 Pedagogical practice was strengthened through the school’s involvement in the NPDL Partnership as they used the tools, strategies and processes – like the Collaborative Inquiry Model – to provide a framework for the learning, providing insight, oversight and foresight on learning design. The Six Competencies – Collaboration; Critical Thinking; Creativity; Citizenship; Communication; and Character – combined with the SOLO Taxonomy to enable students, teachers and the school leadership team to have a conversation about student learning and understanding, skills, and depth of thinking. 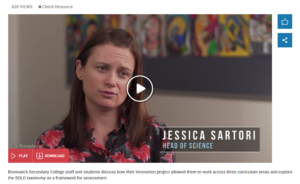 As one student says in the video, these frameworks help students to identify “where we are, where we can improve and what we should try to do next”. 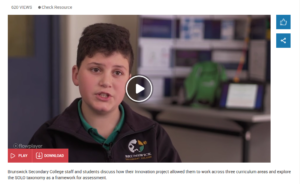 Brunswick Secondary College staff and students discuss how their Innovation project allowed them to work across three curriculum areas and explore the SOLO taxonomy as a framework for assessment. Do you know any creative and critical thinkers at your school? Essential Resources are running a “Tag a teacher” competition on their Facebook page. Surprise a colleague with some great professional reading for the summer break.